Electromagnetic induction, or the production of electric current in a conductive element as it moves through a magnetic field, has been leveraged to generate power for a number of so-called "shake to charge" or "batteryless" consumer products. Technology based on the phenomenon has been used for years to power small, power efficient devices such as flashlights and radios. To produce enough electric current, these systems usually use a thick coil of copper wire as the conductor, adding to the product's size. 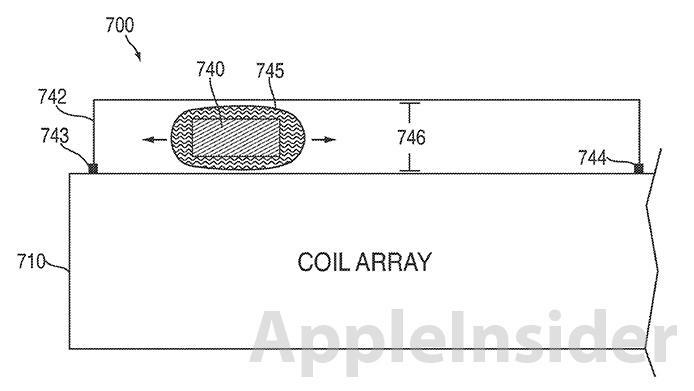 Apple's invention proposes the use of printed coils with one or more moveable magnets, a reversal of the traditional configuration in which the heavy copper coil moves across a stationary magnet. 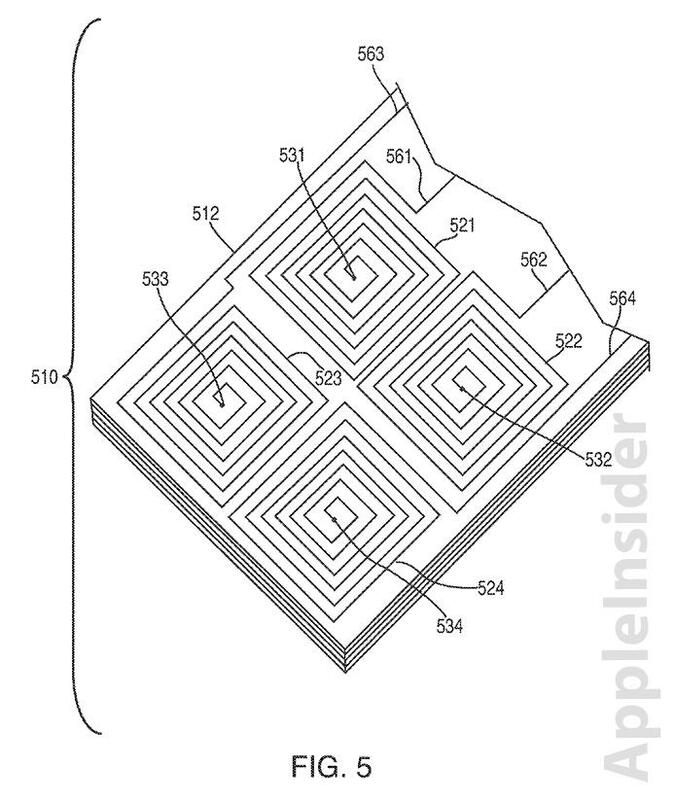 The magnets in Apple's system move alongside a circuit board holding printed coils to create an "electromotive force," or voltage, across said coils which can be used to generate power. Key to the system's functionality is the creation of the printed coils, which Apple claims can be formed using any technique for printing modern circuit boards. As an example, printed coils can be formed by "depositing copper on a substrate to form traces in the shape of coils" or "selectively etching copper from a substrate" to achieve the same effect. Illustration of printed coil formation. In order to achieve required power levels, the circuit board can contain multiple layers onto which the printed coils are formed. The multitude of layers are then coupled together using vias, or electrical connectors, to create a coil array. 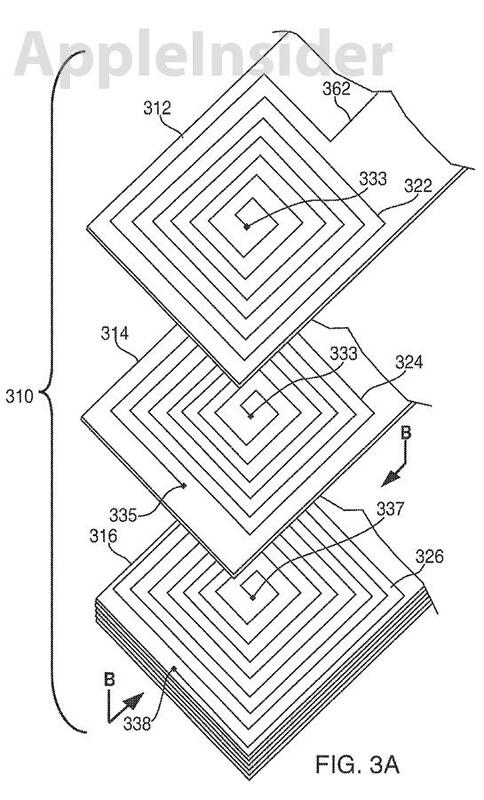 Apple notes that in one embodiment the coil array can be formed from stacks of circuit boards. A magnet or set of magnets are allowed to move freely alongside the circuit boards to generate an electromotive force across the coils. In one embodiment, the invention calls for a housing to guide the magnets, in which a lubricant is introduced to facilitate free movement. As the magnets move across the printed coils, either by a user shaking the device or simply by moving it through normal use, electric current is produced. After flowing through power conditioning circuitry, the generated electric current is stored in either a large capacitor or battery that is connected to a control circuit. The entire unit can be mounted in a portable device, with the application's language specifically noting Apple's iPod and iPhone as two possible candidates. Currently, the two products' energy requirements are likely too great for an electromagnet induction system, meaning they will continue to source their power from wall outlets and computers. The electronic components inside Apple's iDevices are becoming more efficient, however, and might one day reach a point where such a system can provide enough energy for daily use. While it is unclear if Apple will choose to use the technology to power future products, the invention serves as an indicator that the company is actively looking for ways to make its electronic devices truly wireless.